Back in 1913, as the city of Atlanta was expanding, Georgia Power took interest in this waterfall and completed a dam to conserve it's power. Although this changed the purpose of the falls, the beauty was preserved. There are five waterfalls that make up this beauty; Ladore, Tempesta, Hurricane, Oceana and Bridal Veil. To see the splendor of these falls there a few options. You can hike the rim trails to reach various overlooks along the way. At 1,000 feet deep, the ominous gorge has been impressive enough to have been crossed two times by high-wire acrobats (once in 1886 and most recently in 1970). But, don't worry, you don't have to be a tightrope walker to cross the gorge. Today, you are welcome to trek across the canyon by way of a suspension bridge which sways 80 feet above the base of the gorge. If you are seeking adventure show up early and get a Gorge Floor Access permit. There are only 100 issued per day and they are given on a first come first serve basis, prior to 3pm. This strenuous trek will take you down 531 stairs to the gorge floor where you can cross the river, climb the boulders or go for a swim. To see the beauty of Tallulah Gorge State Park, there is a small $4 daily fee or camp out in a tent or RV for only $10 or $12 respectively. When you head to Amicalola Falls get ready to be captivated, as it is the highest waterfall in Georgia (and the highest cascading falls east of the Mississippi). This stunning waterfall cascades down for 729 feet. It's name Amicalola Falls describes it best, which in Cherokee means "tumbling waters". This amazing natural wonder is located in the north Georgia mountains only 45 miles west of Helen. There are a few ways to see this waterfall. For anyone with physical limitations there is a beautiful spot located on the trail below that offers magnificent views. This area is wheelchair accessible. For a closer look and a bit more exertion, you can make your way up 604 stairs to reach the overlook at the top of the waterfall. This is also a great choice for those looking to get an extra punch on their Canyon Climber's Club Card. Along the way, you can rest and take photos at the first landing located at the 175 stair marker. Either way you choose to view this magnificent waterfall, you will be glad you did. There can be no doubt about the fact that the scenery in northern Georgia is absolutely breathtaking. One of the best ways to get amazing views is by hiking in the mountains, and Mt. 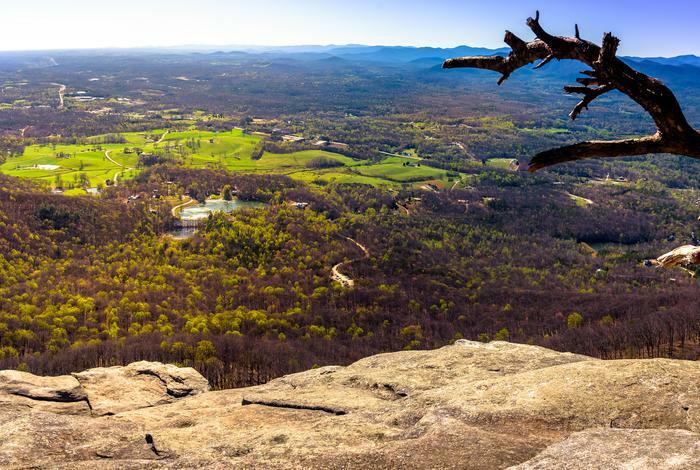 Yonah is an extremely popular spot for both locals and visitors alike. 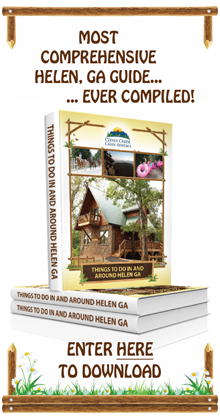 The trail head is located a mere 6 miles southwest of the city of Helen, making it extremely easy for vacationers to access. You'll find that trails are open year-round, and that dogs are welcome to join you for a hike. For those who are not used to hiking in the mountains or may be less active, it is advisable to stick with the beginner's trail. The path is fairly even and easy to walk along, and goes all the way to the top of the mountain, which is where you will get the best panoramic views of the hills and valleys below. For more of a challenge, though, try your hand at the 2.3 mile long Yonah Mountain Hiking Trail. Although this particular trail isn't especially long, it is quite steep which will get your blood pumping. But despite the fact that it is more challenging than the beginner's trail, hikers will be rewarded with miles and miles of incredible sights as you climb higher up the peak. The entire path is lined with scenic overlooks of the world below you. Be sure to bring your camera along to capture some shots of the spectacular Georgia countryside. Regardless of which trail you take, you will find several rocks at the summit that can be climbed. Seasoned rock climbers might choose to practice climbing and repelling off off a 200 foot granite rock face, whereas others might stop to pose for a photo on one of the many ledges at the time. Situated in the scenic and beautiful Unicoi State Park, you will find Anna Ruby Falls. This lovely natural wonder is a sight to behold and is extremely popular, as it is actually a twin falls. The two cascades are formed at a fork where Curtis Creek and York Creek separate. After falling 153 feet and 50 feet, respectively, the two streams join together and become Smith Creek. This eventually feeds the majestic Unicoi Lake. Getting to Anna Ruby Falls is easy enough. Visitors can expect to hike on a simple, paved half mile trail before reaching the two viewing decks for the falls. The trail is handicap accessible, so anyone is free to make the trek to the dual cascades. You'll be able to enjoy the amazing sight from either platform, which are at the perfect vantage point for taking pictures. For those who would like to experience more of the area around Anna Ruby Falls and get a bit more exercise, there are also options. 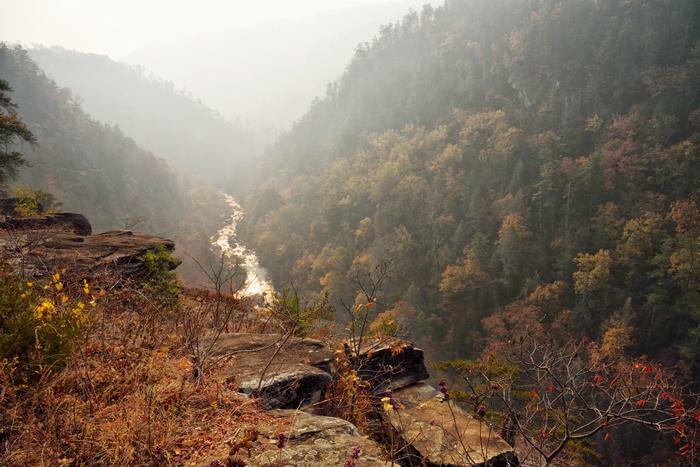 By choosing to hike along the 4.6 mile Smith Creek Trail, you will be able to take in the sights and sounds of Unicoi State Park, all the way to the base of the cascades. You'll get the chance to explore the natural beauty of the park and obtain some different views of the falls. The Chattahoochee River, which runs right through the center of Helen, is truly the heart of the charming Alpine village. Not only are the waters cool and beautiful, but they also enable visitors to experience a wide range of water-related activities. One of the most popular things that vacationers like to do on "The 'Hooch" is go tubing. When it's warm outside, there's nothing more inviting than an afternoon of splashing in the river as you float along with family and friends in an inter-tube. Another great option is to go canoeing or kayaking. For a more peaceful day on the river, groups can set out on a quiet area to canoe, enjoy the sights, and make memories. More adventurous groups, on the other hand, may choose to visit some class 2 or 3 rapids by kayak. And, speaking of rapids. For a fun way to enjoy the water of the Chattahoochee River, try rafting. If you’re nervous about rafting because you’ve never done it before, this river is a good place to try it for the first time. Most of the time, the water is relatively calm and you’ll be able to focus on fully appreciating the beautiful natural environment of the Georgia mountains. And of course, there's always fishing. Trout is plentiful in the river and the fish is delicious to eat. Many people consider the river to be one of the best fishing spots in Georgia, due to the large size of the trout there and the limited fishing regulations on your hook type and bait use. The river has something to offer everyone. Stone Mountain, although not technically in the north Georgia mountains, is one of the most popular natural wonders in Georgia. Stone Mountain is located in the metropolitan area of Atlanta, only 1.5 hours from Helen. This mountain is the world's largest exposed mass of granite and is full of history. The mountain was first used as a ceremonial place for Native Americans, namely the Cherokees. This was before the signing of the 1821 Treaty of Indian Springs when Stone Mountain became a settlement for European Americans. Then, in the 1850s as the mountain became more well known, it transformed into a tourist resort. Today, the mountain welcomes millions of visitors each year and an entire adventure park has been built around it. It hosts the Geyser Tower, the Skyhike, the Summit Skyride and a scenic railroad. You can enjoy all of this plus much more for a daily pass fee of $28 for adults and $22 for children. If you prefer, you can escape the crowds and pay only the $10 parking fee. This gives you access to numerous hiking trails around the mountain which are excellent for both the beginner and experienced hiker. For this small fee, your children can also enjoy the playground, picnic areas, Quarry Exhibit and the Education Center. If you stay into the evening hours you can also see the brilliant display of the Lasershow Spectacular. Although it's a bit south of the Helen, making a day trip to Providence Canyon State Park is definitely worth the time and effort. In fact, the park is home to among Georgia's most photographed landscapes because of it's magnificent colorful soil and landscape within the canyons. The most unique thing about the canyon is that its floor is perpetually wet. It is actually an exposed water table and it creates a beautiful pattern in the sand known as a "braided stream". No wonder it's one of Georgia's seven natural wonders! Canyon Climbers can also get a punch in their card by hiking the loop trail and voyage into scenic canyon 5. Although not considered one of Georgia's natural wonders, Cloudland Canyon State Park is the last stop for any Canyon Climbers out there. 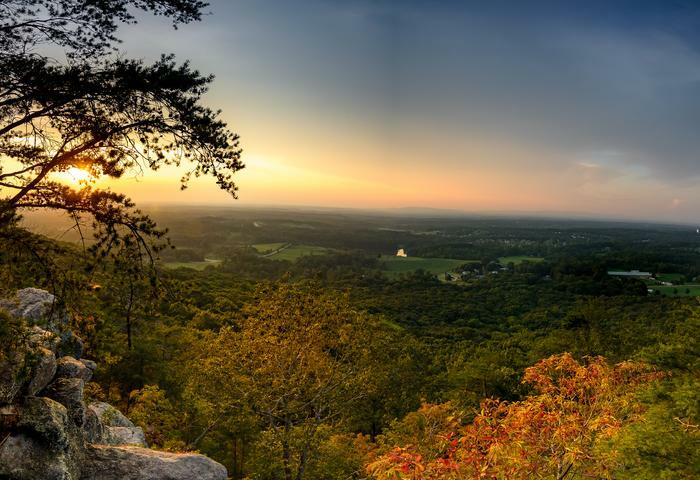 Just west of Amicalola Falls, this park is nestled on the edge of Lookout Mountain. The rugged gorge within the park features over six miles of hiking trails. Included in these trails is the one mile waterfalls trail which requires hikers to hoof it up a 600-step staircases and back down again in order to get their club card punched. During times of low water, the falls can become small, however, the scenery in the park is considered some of the best in the state, making it well worth the trip. As its name implies, Rocktown is a collection of sandstone boulders, most of which are 30 to 40-feet high. The site, located in extreme northwest Georgia, is popular with rock climbers. Pickens County, located just north of Atlanta, is the site of one of the largest marble veins in the world. Marble from this vein, which runs four miles long, has been used to build the majority of marble buildings and monuments in Washington DC. There are several state parks in Georgia that you can visit during your vacation. Two of them, Unicoi State Park and Smithgall Woods State Park, are easily reached from Georgia mountain cabin rentals. Unicoi State Park, located near Helen, is a wonderful place where you’ll have many things to do. Make plans to enjoy a full day at the park. Start with a hike to Anna Ruby Falls (mentioned earlier), which is only a half of a mile walk. This waterfall is a breathtaking sight, thanks to the two creeks that come together to form the unique waterfall. After that, eat a picnic lunch in a cove that provides picnic tables at Smith Lake. Then you can swim and fish the day away before going back to the warmth of your cabin. Another state park to stop by is the Smithgall Woods State Park. If you like to ride a bicycle through nature, you’ll especially appreciate the 23 miles of trails at the park. However, if you prefer to stay on your two feet, these trails are equally suitable for hiking. For a more informative hiking experience, you can sign up for a guided tour at the park. Whether you choose to see one of these natural wonders or all of them, you will be glad you made the trip. Pack up your family and head into the north Georgia mountains for picturesque views and memories that are sure to last a lifetime. Have you witnessed the beauty of any of Georgia's natural wonders before? Let us know your favorite spots in the comments below. There’s so much to do and see when you stay at one of the Georgia mountain cabin rentals. It’s truly a great way to have a vacation that allows you and your travel partners to live, eat, and breathe Mother Nature. Oops, we left one other Georgia wonder off of the list! It's Cedar Creek Cabin Rentals of course! Cedar Creek Cabin Rentals is the ideal luxury cabin rental destination for friends, families and couples. We would love to help you discover the magic of the north Georgia Mountains! Click here to check out our cabins.